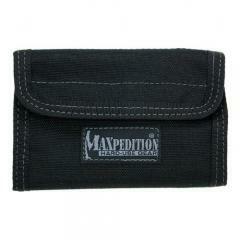 The Maxpedition Spartan wallet is a tough, low-profile design that provides plenty of storage space without excess bulk. It comes with two long slots, making it easier to keep foreign currency separated, as well as multiple internal pockets with Velcro closures for security that can be used for cards or coins. It also features an external mesh slip pocket. The wallet is made from 1000 denier ballistic nylon, with reinforced stitching in strategic areas for extreme durability. It features a triple polyurethane coating and taped internal seams to keep the contents dry, plus a Teflon fabric protector that resists stains.